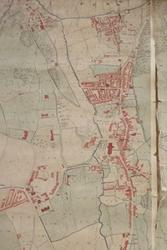 Part of one of the Penrhyn Collection maps of Bangor which requires conservation work. Papers providing an unbroken record of an important Welsh estate, and which tell us a great deal about life in north Wales over the centuries, are to be safeguarded following a grant to Bangor University’s Archive and Special Collections. Vital conservation work to fragile maps contained within the Penrhyn Estate documents is to go ahead thanks to a partnership between the Welsh Government and the National Manuscripts Conservation Trust (NMCT). The Penrhyn Estate documents provide a unique and valuable insight into the management of an estate in North Wales during the nineteenth century. Some of the maps are important for evidencing the historic issues of the time. For example, the Penrhyn/2219 map was produced as a consequence of a cholera epidemic in Bangor in the 1850s and is therefore a valuable research tool in understanding this significant episode in the city’s social history. The Penrhyn Estate papers were accepted for the nation in lieu of inheritance tax in 2010 and are considered to be of outstanding national and international significance. Archivist Elen Simpson with some of the Penrhyn collection.“We are already undertaking a large project to create a catalogue for the most recently acquired Penrhyn papers through a National Cataloguing Grants Programme, and this will ultimately be placed online to become accessible to researchers far and wide. 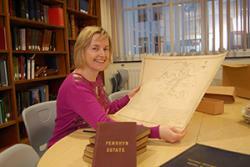 The ‘Penrhyn Additional Maps’ collection are an important part of the area’s heritage. They are a significant historical source for local and landscape history from the mid-18th to the early 20th century. “There is a fantastic range of items receiving funding this year, including the Penrhyn Collections, which was judged to be of exceptional significance when it was accepted for the nation in lieu of inheritance tax. Since 2008 the NMCT, in partnership with the Welsh Government, has supported 35 projects. Items and collections of national and international importance held by archives across Wales. “We are absolutely delighted that our long term partnership with the Welsh Government is ensuring that more, important Welsh manuscripts are being conserved than ever before.